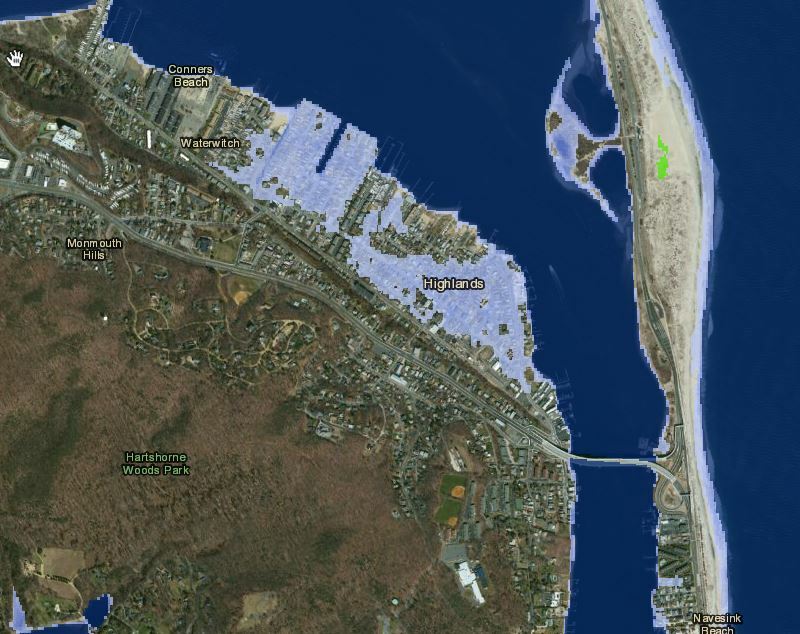 I found an interactive map from Rutgers that allows you to see how the rising sea levels will affect certain areas. So I plugged in Highlands and this is what I found..
Look familiar? What I found interesting was that at 2 ft, that’s our normal flooding pattern in High Tide, at 3ft that’s our flooding pattern for big storms. Beaches & Oysters – instead of back filling the town, back fill beaches and add oyster beds to the water side of the strategically placed Sea Walls. Increase height of Marina Bulk Head Walls – I’m thinking 4 ft high (from the dry side ground), and you would need steps on both sides. Fixing the Drainage problem & have regular maintenance of the catch & sewer drain flaps. I think most people downtown between Snug Harbor & Sea Drift have noticed an issue with drainage since the we “updated” the sewers. Not sure what we did then, but it made the situation worse, not better. House lifting – You can’t have the bungalows just on slabs anymore, you need to be at least 4 ft high. French Drains on RT 36 – we need something done on the run off. Just having Middletown paving the road to Monmouth Hills won’t work. It’ll just make the water run off that much faster. We need a catch up there too. Excellent list for getting something started in town. Thanks for the effort and info. Thanks for the aerial photos! So Highlands is on a river AND a bay? Finally NOW I know why it floods! And can’t we call them “Freedom Drains?” What have the French EVER done good – except for the can can sale at Shop Rite? You can call them whatever you’d like, just as long as they are installed. Love the maps. And interesting how accurate it is. I want to run to Tom’s River and grab their town engineer. This is the voice of reason that THIS town needs, most definitely not Dale. Also, just for more fun, Keansburg is collecting storm debris through April 15. 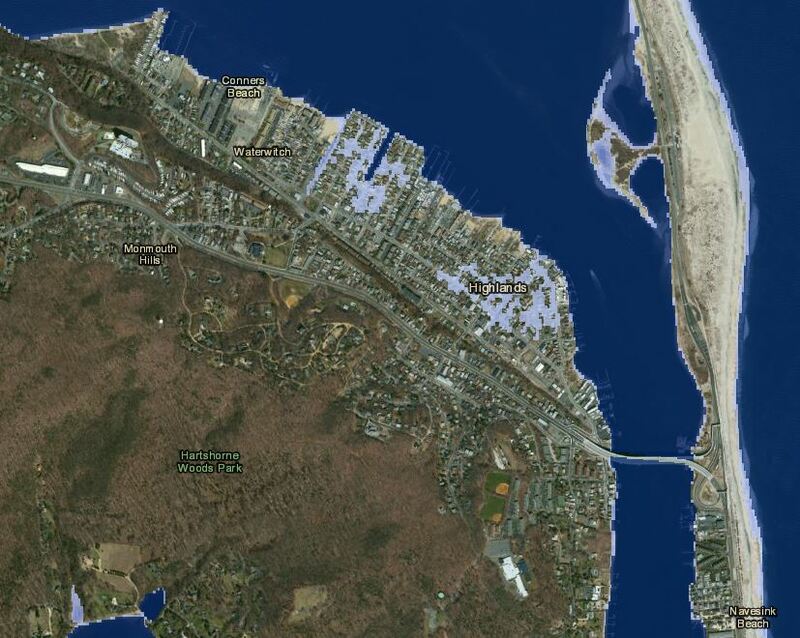 KEANSBURG!!!!!! Ok, can someone correct me if i’m wrong, but wasn’t Galveston TX one of the examples that was given on towns that filled themselves in to alleviate flooding? So they did that in 1900, but in 2011 after another 100 year storm they got 31m from FEMA to raise 224 homes. http://www.fema.gov/news-release/2011/10/04/fema-awards-more-31m-elevation-224-homes-galveston-co-texas – so proves raising the town works right?? But this is for Galveston County, not necessarily the town. Not sure how the town itself did after Ike, but I remember seeing this picture everywhere (http://ireport.cnn.com/blogs/ireport-blog/2008/09/18/the-last-house-standing) which is further down the barrier island. Has anyone on here been put on Highlands Hazard Mitigation grant program? I am both sad and scared that I have no idea what this is. Who do i have to deal with for this?? Yes Dale…. I don’t think they have any further info on it yet but was curious if anyone had known about it. I’m in panic mode now about this. I’m seeing all these links online about this town and that town having deadlines for applying for this FEMA Hazard Mitigation Program. And there’s nothing at all on the Highlands website (shocking, I know). Will find out if Dale answers email, I guess. Call and confirm that if you got a ICC letter you were on the list that is my understanding, the deadline I believe was in Feb. It has been assumed for too long that the powers that are know all or any of the answers. If you find out you have missed out on a deadline for assistance because of not being kept in the loops by the powers that are please let us all know. One door being closed in your face does not have to be the final answer. Dale responded, at almost midnight. So the panic is notched down a level or two. I’ll follow up at the thing on Monday or at the Solutions Center.